Welcome to Occupied With History, a new column from Grant Mitchell, AKA the Millennial OT! Every month, he'll be sharing stories of the origins of Occupational Therapy. Stay tuned for more! In a 1993 young adult dystopian novel often assigned in High School English, Lois Lowry mentions occupational therapy (OT) as one of the fictional future vocations that people can be assigned. The main character of the book, picked for the novel’s eponymous position of The Giver, takes on the unfortunate position of holding all memories of history for the community, who are otherwise unaware. In the community portrayed in Lowry’s novel, knowing history is considered a burden; however, through this dystopian portrayal, the author aims to convey the value of shared memory in defining who we are. Being connected to our past can be incredibly helpful for dealing with our present problems. One of the fascinating things about history is how familiar the problems are to modern situations. While we may continue to debate what the meaning of occupational therapy is, the debate has changed very little from the first days. Today we have arguments about smartphones and screen time; about whether it's an opportunity or danger. Some get excited about the possibilities of virtual reality while others warn of its degradation of modern society. The purpose of this article is not to support one argument over another, but rather to bring to light the exciting insight that can be found in OT history. The information described below comes from the publicly available records of OT’s early days found at American Occupational Therapy Foundation (AOTF)! Is OT all Arts and Crafts? Question: What was the most common activity that would be found in an OT clinic during the 1920's? Answer: Basket Weaving (Haas, 1922a; Haas, 1923). Underwater basket weaving is an idiom often used to describe a wasted academic pursuit. Yet, it’s really a shame, because basket weaving, historically, may have been one of the most useful therapeutic modalities. In some circles, the joke is that to become an OT, you’ll have to take underwater basket weaving just to become an OT. While this is not true and underwater basket weaving may not be an accredited course, some universities have in fact offer underwater basket weaving. Basket weaving wasn’t the only craft used in the early OT clinics. How many OT clinics offer that variety of crafts? Can it be so presented and controlled that the reaction thereto is therapeutic? Can the patient perform at least four-fifths of all the work involved? Haas argued (1922a) "If the answer to any of these questions is "No" the discontinuing or discarding of the craft should be very carefully considered." 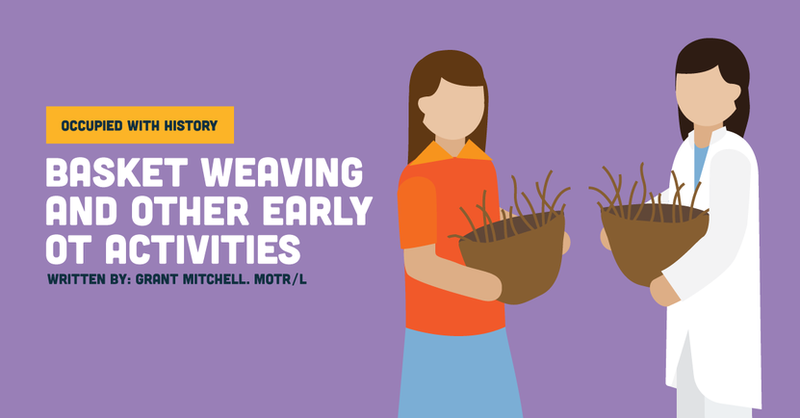 The next time you hear that OT is all arts and crafts, know that stigma has been around for a long time, but you could consider challenging them to a round of underwater basket weaving! Is Fun and Games Occupational? Occupational therapy may have been ahead of its time as well, in part due to the efforts of the tremendous women of the profession. At the time, Gratia Eldridge Harrington was no softy when it came to contact sports. When advocating for the use of Games and Dramatics (aka theater) Ms. Harrington (1923) explains, "but remember that it is only in the last few years, in this present generation, in fact, that females have had the opportunity of getting into a good fight, of feeling the necessity of doing one's share and of taking the hard knocks in the fashion demanded by a strenuous team game." I'm sure if Ms. Harrington were still with us, she might be seen on the roller derby track or rugby pitch! She goes on to say, "I have always felt that the impersonal buffeting that a person gets in a game is an excellent method of loosening up rigid personalities." The early OT argument for games and dramatics were similar to our modern understanding of FLOW as described by Mihaly Csikszentmihalyi (Csikszentmihalyi, 1996). Among several principles, FLOW involves; clear goals, feedback, and that distractions are excluded from consciousness. When using games as a therapeutic tool, as Ms. Harrington explains, "A patient in such a situation does not have to use any effort of will to put those thoughts aside." While the term "just-right-challenge" hadn't been coined yet, Arkinson (1924) explains that it's not so much the games themselves that provide the therapeutic benefit but the "progressive nature" of them. By this “progressive nature” he appears to describe the need to grade tasks to challenge participants. Lloyd H. Ziegler (1924) argued that Europeans in poverty were far more likely to be engaged in games than the American. While Ziegler advocated for games in OT, he argued against "the danger of becoming passive in our recreation tendencies by having much of our amusement dished out to us." What would Lloyd H. Ziegler say about our modern tendencies? With modern virtual reality, sports, and movie streaming, he may have had a good point that's as relevant today as ever. It's difficult to find OT services provided in the way they were during the early days. The difference between then and now is that OT initially employed participants in a productive means, often teaching them craft and trade skills. While it may not be the goals of OT that have changed, the medical model certainly has influenced the format and interventions provided. While the pros and cons of the medical model are frequently debated today, there was certainly no shortage of debates in the early days either. In a fascinatingly peculiar way, a seemingly trivial, yet highly formal debate occurred on the use of toy making as an OT service. It's difficult to determine the "side" or "opinion" of the early OT founder, William Dunton. However, it is certain that he was not afraid to stir things up a bit. Dunton's (1923) argument was essentially that toy making may NOT be the most useful of time use for OT clients, considering the then-rising factory-made toy industry, as well as the scientifically unknown influence of toys on childhood development. Poor Dunton, he certainly kicked the bee's nest! But is that actually a good thing? Herbert Hall seemed to believe so. In a show of true sportsmanship, Herbert Hall (Dunton, 1923) explains, "We welcome such criticisms as Dr. Dunton's because they make us think . . . In argumentative writing, it is usually the case that the dis­putants are nearer together than they realize. In any event, I expect to have Dr. Dunton ordering Marblehead toys by the gross before long." What if we had more debates like this? What can be said of modern toys, or their use in therapy? On the debate of "What is OT?" "Our role consists in giving opportunities rather than prescriptions," says Adolf Meyer (1922), another one of the founding 6 members of the OT profession. It is a near injustice to take small quotations from his early document, The Philosophy of Occupation Therapy (1922). The whole of the document is as poetic as it is useful and relevant today. As Adolf Meyer explains, life is full of "rhythms" that roughly are what we know as occupations today, such as working, eating, and sleeping. It is by "actual doing, actual practice" that people live, so therefore it is the occupational therapist’s job to provided, as Adolf Meyer (1922) says, "opportunities to work, opportunities to do and to plan and create, and to learn to use material." These opportunities are often provided during therapy, through "a natural simple regime of pleasurable ease." Which arguably means: we ought to make therapy interesting, to offer a graded approach pushing participants towards healthy engagement in meaningful and purposeful activity. What is the most important quality of an OT? Well, according to Adolf Meyer (1922), "It takes, above all, resourcefulness and an ability to respect at the same time the native capacities and interests of the patient." It would take another 75 years for the first Occupational Therapy Framework to be developed. It seems, despite our run-ins with history as well as the influence of the biomechanical era and medical model (with their strengths and weaknesses), occupational therapy has not strayed far from its roots. When Adolf Meyer states "Present day humanity seems to suffer from a deluded craze for finding substitutes for actual work," one couldn't tell if he was talking about the 1920s or the near 2020s. It seems we are in the practice of "actual doing, actual practice." For whatever that might be, it is visible in the movement and engagement of the human in occupation. For a fantastic video on the History of Occupational Therapy, watch Celebrating AOTA's Centennial: A Historical Look at 100 Years of Occupational Therapy! This article will tell you EXACTLY what to put in your cover letter to present yourself as a top candidate.